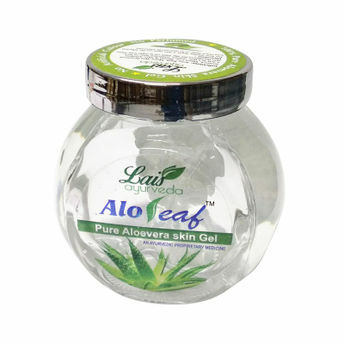 Aloe vera moisturising gel is an all-in-one multipurpose product that works wonders for your face, skin and hair. Made from India-grown certified organic Aloe Vera, cold pressed to preserve all natural properties, this aloe vera pure gel is free from synthetic ingredients. With its skin soothing properties, Lais Ayurveda's Aloeleaf Moisturizing Beauty Gel nourishes skin, gently alleviates and soothes sunburns, bug bites, rashes, cuts and wounds providing effective relief naturally. This 100% pure, natural aloe vera gel is a must-have in your vanity as it not only moisturizes, hydrates and nourishes the skin but also provides the hair with great luster and shine. This clear, non-sticky gel absorbs rapidly into the skin and doesn't leave sticky feel, keeping your skin soft, smooth and glowing.